Should we give (close to the edit box) advice against asking personal diagnosis/treatment questions? I don't have any stats, but my impression is that about half of the questions asked here by new users are "what's wrong with me?" closely followed by "suggest me a treatment". I'm not sure exactly where this customized advice/warning could be displayed. If the "How to ask" (which is displayed to the right of the edit area) can be customized, that would probably a good place. There seems to be enough room there, assuming the box expands downwards if more text is added to it. Do not ask here for a diagnosis (e.g. "what's wrong with me?") or for treatment suggestions for your personal problems. Scientific questions about disorders, including their diagnosis and treatment, are welcome as long as they are asked in a sufficiently general way, so they are relevant for other users. By all means, please suggest improvements to this in your answers. 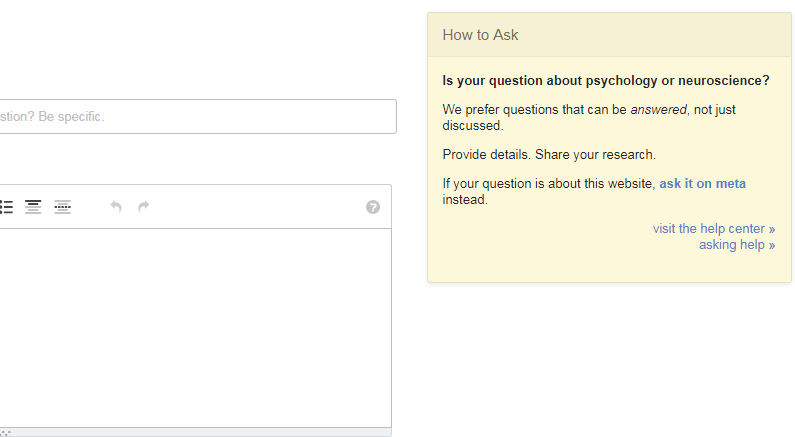 Which settings should we choose for the posts to the cogsci.SE Facebook page? Should we adjust the 'self-help' close message? Are we being a bit too liberal with the 'close question' function? Disambiguating close reasons: when should questions be put on hold? Should we close specific programming questions?